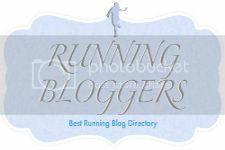 Food, Running, and Other Ramblings: They Say It's Your Birthday!! Today was a short day at work. I just had to work on some things for a meeting we are having at the end of the week, so I was gone by noon. I made oatmeal to eat for breakfast, but forgot about it and ended up with a banana and coffee. I tried this almond coconut milk by Blue Diamond Almond Breeze. I don't know if it is supposed to taste like that or if I got a bad carton, but yuck. It was a very strong flavor, sort of sour. I am going to email them and let them know. The only reason I tried it was because it had a lot less sodium then the other stuff. I ended up buying regular unsweetened almond milk today. I can't bear to think of drinking the other stuff again! After work I had to run to O&H Bakery to pick up my mom's birthday cake. She wanted a Danish Layer and while I am usually about making my own stuff, I just didn't have the time to make that fancy thing. I called my mom to see if she still needed me to take her to the doctor's at 1 to get her stitches out. She said my dad was going to get up and take her. I think he wanted to spend a little time with her on her birthday and since he works third shift that would be the only time they would really get. I got home and had to run 3 miles today. I was not looking forward to it, and no, I never really am. 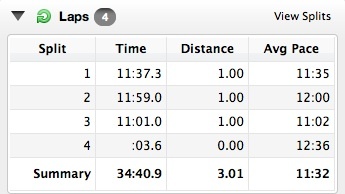 I decided to see if Becky had gone yet since I know she had a 3 miler to do also. She said she hadn't and was in her running clothes waiting to go. So we met up just after 1. We started out at a pretty brisk pace, around an 11:30. I was surprised since I was whining in my head about how tired I was. We kept it up pretty well, too. We passed a lot of time just talking. We hadn't seen each other in a couple of days so had things to catch up on. We finished in 34:40 which is definitely one of my faster ones. I am a bit sore now though. Tomorrow I have a speed workout. It will be the second one I've ever done. I have to do 8x400's. I know I will definitely be sore after that. I will keep you posted. After my run, I went over to my mom's to take her to work so she could drop off her doctor's excuse for yet another month off. We also stopped at the Dollar Tree so she could pick up some puzzles to do. I made her take a cart so she had something to lean on. The carts also have this really long pole on them so you can see where people are. I told her then I would be able to find her if she wandered off. When we got home, Kevin came over and we had cake. Kevin actually ate some. He does not like any fruit or any fruit related products. My mom told him that she could not even taste the raspberry jelly, because there was so much custard. He had a piece and then said yes to taking some home when my mom offered. He also took home some home made au gratin potatoes with ham. My mom feels so bad for him since I really don't cook meat for him. She doesn't find my argument of him not cooking meatless for me as a valid argument. She's old school. Kevin chowing down on left over cake. Scraping the frosting off the tinfoil. I haven't really been watching much T.V. lately. We got rid of all of our extra cable and just have basic now. I convinced Kevin that if we do that and join a gym, we will still be saving money. Those are two words he likes to hear together. I'm sure it will be a bit before we join now though, since we had to buy a new water heater, but it will be soon. Time really flies when I don't have a constant stream of shows playing in front of me. At 9:30 I was thinking about how I want to watch Chelsea Lately then looked up at my clock and it was almost 11! Where did the last hour and a half go? What are some of your non-T.V. related activities? Nice blog! I'm a tv addict too, although here in the UK we don't have as many channels as you I think... I like settling down with a good book too, and of course blogging! It's definitely nice getting away from the T.V. once in a while.